The Wild Colonial Boy is an Irish-Australian song about a Robin Hood style character who “robbed the rich to help the poor”. 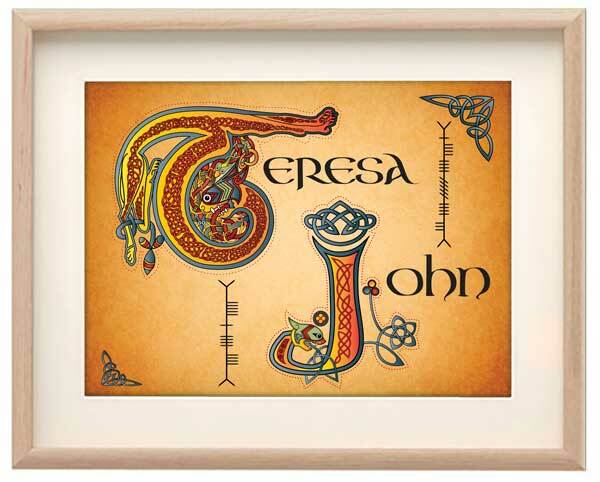 It’s from a long line of songs that celebrate what the Irish called ‘rapparees’ – outlaws who stood up against the rich and powerful. Brennan on the Moor and Whiskey in the Jar are other notable examples. The facts of the story are a little blurred but the song is based on a true story of a young man called Jack Donohue who became an outlaw in the early, pioneering days of Australia in the 1820s. The early Australian version of the song referred to the main character as Jack Donohue, but that may have been banned as being seditious. It’s thought that singers at the time responded by changing the name to Jack Duggan and altering the details of the song a little to mask its origin. 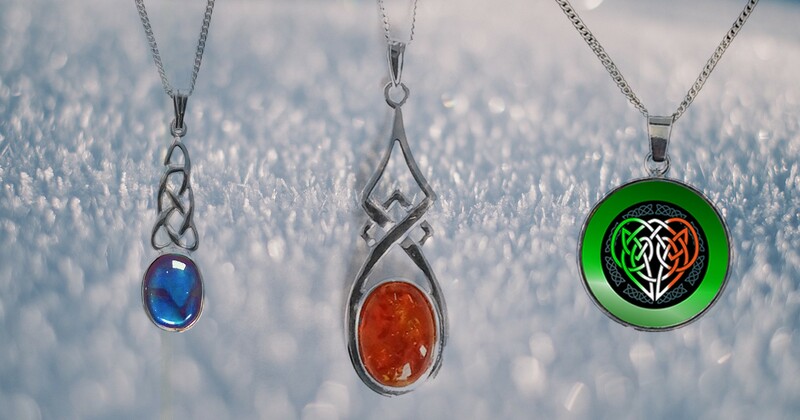 This may explain why there are so many variations. The song begins by telling us that Duggan, or Donahue, was born and raised at Castlemaine, a small, picturesque town in Co Kerry in Ireland. He left for Australia when he was only 16 years old, but we’re not told why. 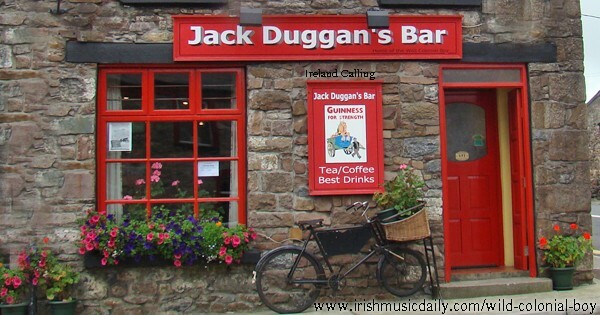 There’s a pub in Castlemaine in Co Kerry called Jack Duggan’s Bar, much to the delight of tourists who have their pictures in front of it. It’s unlikely that Duggan left by choice. People hadn’t yet started to emigrate from Ireland in large numbers in the 1820s – that didn’t happen until after the Great Famine in the 1840s. It’s far more likely that Duggan was sent to Australia as a convict. The British authorities had started shipping thousands of prisoners to the colony to help work the land. This was a time when stealing a loaf of bread or hunting for hares on a landowner’s fields was enough to earn a sentence of 14 years hard labour. See the song Van Diemen’s Land for more details. It’s likely then that Duggan was transported after being sentenced to a term of penal servitude for some minor crime. He managed to escape and began life as an outlaw, which according to most versions of the song, lasted for “two long years”. Some historical references show that the song does have a solid foundation. There is a town called Beechwood in Australia; it’s on the Gold Coast between Sydney and Brisbane. It was an emerging gold mining town in the 1820s and, as the song suggests, it was presided over by a Judge McEvoy. Like most outlaws, Duggan’s career was spectacular but short-lived. He was eventually captured by three troopers who ambushed him as he rode along. He refuses to surrender and in the ensuing fight he shoots two of the troopers. The third, however, hits him in the heart with a fatal shot. The man who kills him is called Fitzroy – almost certainly an Irishman himself. It seems ironic that an Irish outlaw, celebrated for challenging the rich and the British authorities, was finally brought down by a fellow Irishman. Duggan would have only been 18 when he was shot dead. 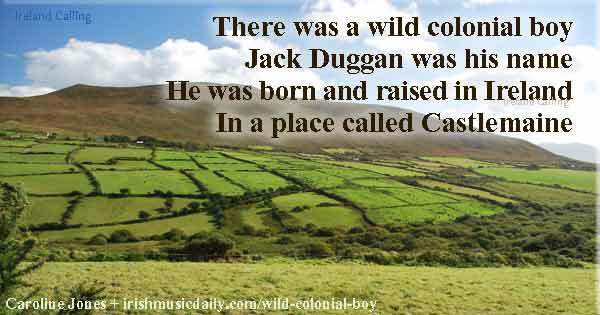 The melody to The Wild Colonial Boy is a variant of the traditional tune of Galway Bay, not the famous ‘Bing Crosby’ version but the one made popular by Irish singer Dolores Keane. The lyrics to Bob Dylan’s John Wesley Harding contain echoes of the Wild Colonial Boy, particularly the line, “he was never known to hurt an honest man”. This is similar to the line “he never robbed an honest man” from the Wild Colonial Boy.